Raita is one of the famous side dish in India. Raita goes well with any type of biryani, pulao, chapatti. See my recipes for Vegetarian Main dish and Non vegetarian main dish. Whenever we feel tired or bored to cook side dish, we can prepare this food as it hardly take 5mts to prepare. Whisk the curd to fine consistency so that it becomes slightly thicker than butter milk. Add all the ingredients and mix well. Check for salt. If you want to add more salt you can do at this time. 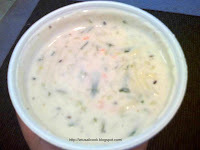 You can also prepare this raita with only curd, onion and salt. Hi Sangeeth. I'm a regular at the cooking forum at garden web. I saw your lamb biryani recipe there and would like to encourage you to come back and visit and participate with us. We are in need of someone with your skills in the art of Indian food. Your blog and recipes are super and I've bookmarked them for myself. Thanks James. Will sure participate in the forum and share my recipes.